As the Christmas season fast approaches, our minds dwell not only on what we can do for others but on how we might enhance our own lives given unlimited wealth and of course our own good taste. So if your great uncle George remembered you in his will or the money tree you have in the backyard produced an excellent harvest this holiday season, here are four definite must have life enhancers. Everyone knows that the car you drive says a lot about who you are. This car will define you as one who has the ultimate need for speed and impeccable style. 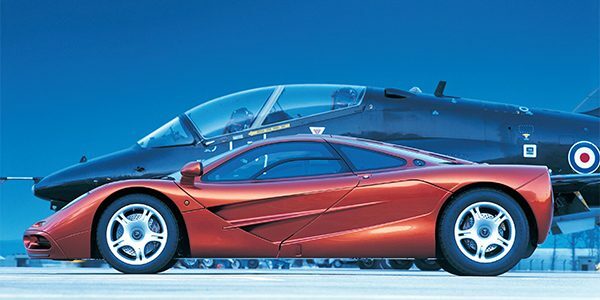 The McLaren F1 is the fastest, most powerful and most expensive production car in the world. The F1 was developed by McLaren cars LTD, a subsidiary of one of the world’s leading Formula One Teams based in Britain. CD system, Air Conditioning, Power Windows. Seating for 3 including the driver in a central driving position. TOP SPEED: 237 MPH, THIS IS THE FASTEST ROAD CAR IN THE WORLD! Price tag: £634,000, that’s about $ 1.6 Million Canadian! Meanwhile, if you have just recently come into some money, renting a supercar for a holiday or a road trip could really make a statement, check out Supercar Hire, they have some of the most loved supercars in the world available for rent. Everyone in life needs a little music to excite or calm the senses. 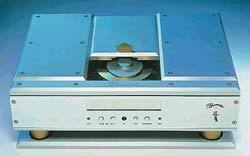 This combination of essential components, amplifier, CD player, Digital/Analog converter and speakers, is the most expensive at this time. Not being an audiophile I can only assume most expensive equals best sound. You can purchase this system and be the judge. Guaranteed to blow the doors off your bedroom. Power! Power! And more Power! The Ultimate listening experience! Unprecedented control and accuracy, ensuring maximum performance. Krell CAST circuitry for the most accurate signal transfer between analog components. 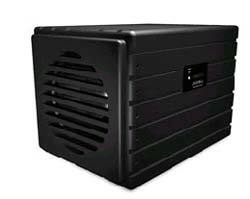 Case: 1 inch machined aluminum chassis encases two 15-inch woofers with wind tunnel like air flow, a sophisticated digitally controlled crossover network, and remains totally immovable under all conditions. Belt drive and triple mechanical de-coupling of the drive unit insulates the sampling process from all external interference.Perfect digital replication of the analog wave shape. Differences between analog and digital sound reproduction are beyond your ability to hear them.Silver or black anodized chassis.Screws and plaques are available in gold-plated. Remote control supplied as standard. 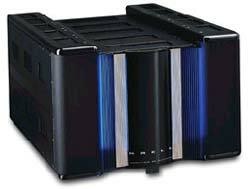 The 970 SRC in tandem with the 969 Reference-Line Belt-Drive CD Transport are rated as the best digital playback system in the world market today. Sound quality and technology are unsurpassed. Accurate digital mapping of the analog music signal. Manufactured from 3mm and 15mm thick aluminum plates in several chambers. Tuned carbon fibre suspension in the proprietary aluminum base insulates the 970 SRC from mechanical vibrations and phonic affects of any kind. 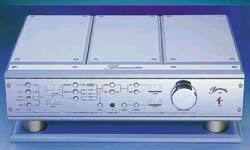 Digital and analog filter combinations are programmable as presets. Two midrange tweeter screens and two bass towers. Twenty-six tweeters are constructed of a proprietary 1 ” ribbon built from an incredibly thin membrane of Kapton and aluminum (.00127 cm thick). The midrange module is a new single 75″ dipolar ribbon driver. The entire device is suspended in a powerful magnetic field created by over 30 feet of barium ferrite magnets. 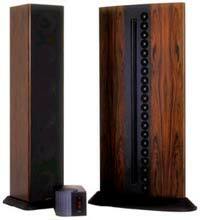 Total price for the above stereo system is $329,500 US. Happy Listening! 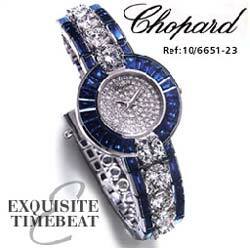 When you have gone deaf from listening to your new stereo system, you can go shopping for a new watch. Think Diamonds! Diamonds! Diamonds! The “Haute Joaillerie” collection of the house of Chopard in Switzerland is carefully designed around precious diamonds and magnificent gemstones. 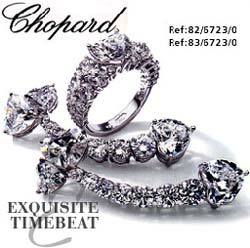 Chopard, founded in 1860, has boutiques in major cities around the world including: Geneva, Bombay, Cannes, Dubai, Florence, Istanbul, London, Moscow, Munich, New York, Osaka, Paris, St-Martin, Tokyo and Vienna. Pink Heart Diamond weighs 15 carats. Blue Heart Diamond weighs 12 carats. White Heart Diamond weighs 11 carats. Pink, Blue and White Heart diamonds are set in a bracelet encrusted with white and yellow fancy shaped diamonds, which design little flowers. Total weight of these additional diamonds is 163 carats. 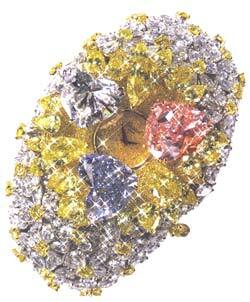 Total Carat weight of the watch is 201 carats. The watch has a spring-loaded mechanism which, when pressed, allows our three heart shapes to mechanically open up, much the way the petals of a flower will in the sunshine. The watch face is exposed from underneath the heart-shaped diamonds. Don’t wear it if you are scuba diving at your next life enhancing experience! Once you have your exclusive watch you will have to go on vacation to help you deal with the stress of this newfound wealth. The most expensive suite in the world is located a short flight away on Paradise Island in Nassau, Bahamas. The suite has 10 rooms so you should be able to accommodate all your friends, maybe even some of your enemies. 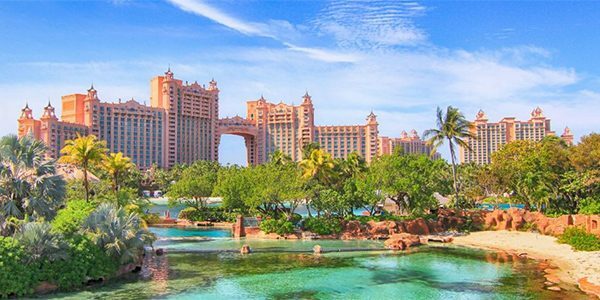 The Royal Towers is the crown jewel of the Atlantis Paradise Island complex and the Bridge Suite offers very luxurious accommodations. The 10 room, 5000 square foot Bridge Suite is situated between the 23 story Royal Towers of Atlantis. Master bedroom with king-size bed and walk-in closet; master bathroom with separate shower, whirlpool tub, fresh flowers, slippers, and robes. VIP concierge services, daily magazines and newspapers, private access via high-speed elevators. Included in the room are two entertainment centres, a bar lounge, baby grand piano and 22 carat gold chandelier. Activities include scuba diving, sailing, snorkelling, and glass-bottom boat excursions. The Best of the Best is something to aspire to, it allows you to go fast, listen to the best music, look phenomenal and vacation in the best style possible. Ah, the stuff dreams are made of.